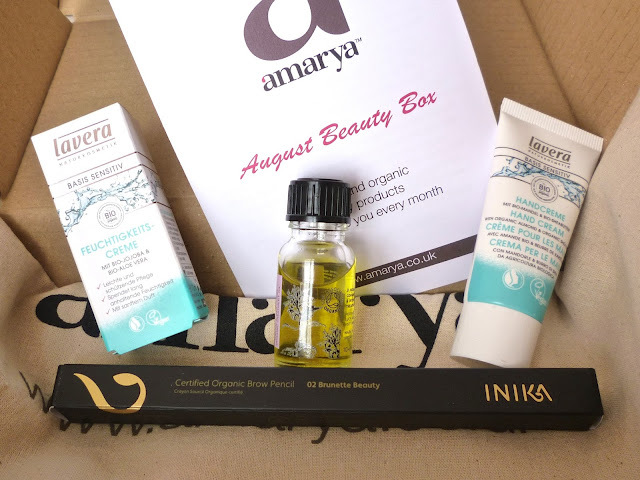 August's Amarya Beauty Box has arrived and yet again I am super pleased with the contents! The brands included this month are Lavera (one of my favourite brands! ), Inika and Lucy Annabella Organics. My only slight issue is that the brow pencil is in the brunette shade. I have quite fair eyebrows so I think the blonde shade would have been a better match for me! Maybe in the future it would be good if subscribers could fill out a little profile about themselves so things like this that come in two shades for blonde/brunette could be split up so people receive the right shade for them! The box is great value yet again this month. The brow pencil alone is worth more than the £12.50 it costs for the subscription! Overall (excluding the tote bag) I've calculated the value to be around £19.60. This month's box also came with some exciting news - a few months ago Amarya combined with LoveLula, and from next month it will become the LoveLula Beauty Box. The best part about this is it means more brands will be included so I'm very much looking forward to see what LoveLula have in store for us next month! I actually need a new brow pencil, tell me how that one is if you end up using it! I haven't received my box yet.. so I was naughty and took a peek at yours - I can't wait to get my box. A little disappointed there's yet another hand cream though, I have tubes of the stuff stacking up..
That would make so much more sense if you could fill out a questionnaire before hand so that you get shades etc that you can use. All of the products look so good though, especially the argan and bergamot oil!